It is always nice to return to a nest that you were filming earlier in the year and carry on again until the young fledge but in the world of wildlife filming this seldom comes to fruition. The Black Guillemots nest had been predated during my absence of five weeks but there was better news with the Hen Harriers. I spent many long four hour sessions in the hide until the young fledged the nest and took their first flight and even better there were five of them! It is good to have been able to follow this pair of Hen Harriers from nest building to fledging their young all in a nine week period. How I wish some of our local raptors had been as successful. 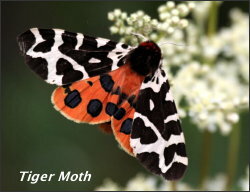 This weeks photo is of a Tiger Moth that we encountered on our way across to the Harrier hide. I have no idea how rare they are but this is only the second one that I have seen on Islay. It was not very active and I suspect that the abundance of rain last week had partially drowned it. In fact on one occasion I had to turf out of the hide a large toad that must have thought it had found the most perfect spot to escape the rain! The only other filming on Islay was of a Kestrels nest with three young about to fledge. This nest was on a cliff face and it is always worth the challenge, especially when you consider that there are more breeding Hen Harriers on Islay than Kestrels. I have just returned from a ten day cruise of the Spitsbergen fiords and the photo shows our boat entering Hornsund on the most perfect Arctic day you could ever imagine. This Arctic habitat is the most pristine on earth and we were blessed with eight days of superb weather; although it did snow on one of the other days! 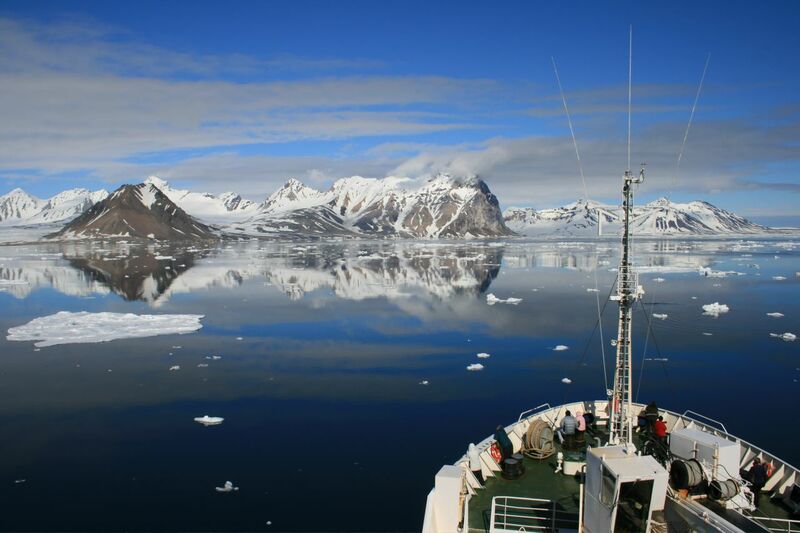 I would recommend anyone contemplating this voyage to allow an extra day beforehand in Longyearbyen. I filled my spare day visiting a Little Auk colony, filming nesting Barnacle Geese and Arctic Terns, found more than ten Grey Phalaropes, five King Eiders and also had some good views of Reindeer and Arctic Fox – all before the Cruise started! The only passerine in Spitsbergen is the Snow Bunting and they are everywhere. We should have cruised all the way around Spitsbergen but this year the whole of the east side is blocked with ice. Before anyone says “What about Global Warming?” this is only year old ice and will be gone by August 1st. In fact some of the glaciers I last saw when I was there eight years ago are now only two third the size. Polar Bears are most peoples reason to come to Spitsbergen and finding them in pack ice is almost impossible. After days of searching we only saw three and one of these was swimming away from us. However. Walrus are now very common and we sat by one rookery with more than one hundred and fifty Walrus present. Unfortunately they were up wind from us and the smell was horrendous! We called at Ny Alesund, the most Northerly village in the World, and I staked out a house that had a foxes den under it. Although there were supposed to be nine cubs under the house only one appeared for twenty seconds – after a cold wait of eighty minutes. We had a barbecue on the deck of the boat in Hornsund on the most perfect day you could imagine but where were the Polar Bears that should have appeared at the smell of dozens of Lamb chops!! It was a fantastic visit to Spitsbergen but the reckoning came on the journey home – twenty one hours of travelling through five countries, including an abortive take – off at one airport. Give me MacBraynes ferry to ISLAY anytime. 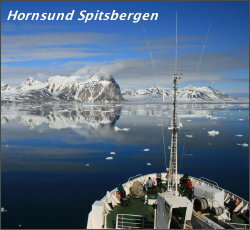 View the full sized picture of Hornsund Spitsbergen as it is amazing.